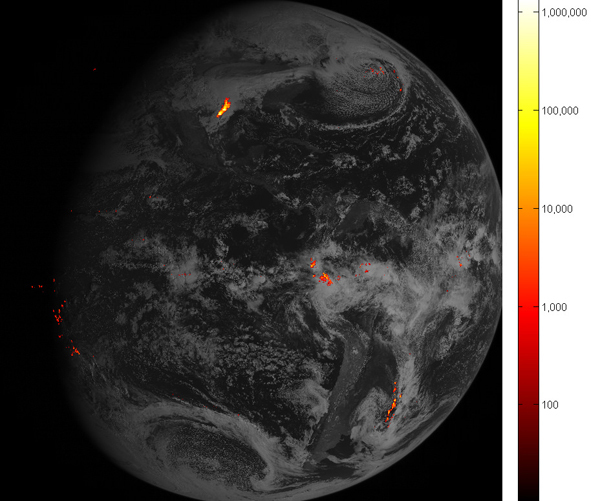 The Geostationary Lightning Mapper (GLM) is a satellite-borne single channel, near-infrared optical transient detector that has been placed on the GOES-16 satellite in a geostationary orbit. This orbital position allows for GLM to measure a dedicated region that includes the United States with continous views capable of providing lightning detection at a rate never before obtained from space. GLM detects all forms of lightning during both day and night, continously, with a high spatial resolution and detection efficiency. GOES-16 (formerly GOES-R) was launched in November 2016. GLM began operation in March 2017 after a dedicated satellite and instrument spin-up period. The use of a geospatial orbit provides increased severe storm warning lead time, earlier indication of impending lightning strikes to the ground, and total lightning detection with nearly uniform spatial coverage of approximately 10 km. Scientists can now study the electrosphere over dimensions ranging from the Earth's radius all the way down to individual thunderstorms. Disseminating lightning information in near real time, on a continuous basis with other observable data, such as radar returns, cloud images, and other meteorological variables provides invaluable data to aid weather forecasters in detecting severe storms in time to give advance warning to the public. The sudden increase in flash rate that has been found to be related to storm severity can now be detected for the measurement region. GLM products contain lightning events, groups and flashes. GLM data are now available at NOAA CLASS. The product to order has the family name: GOES-R Series GLM L2+ Data Product (GRGLMPROD).